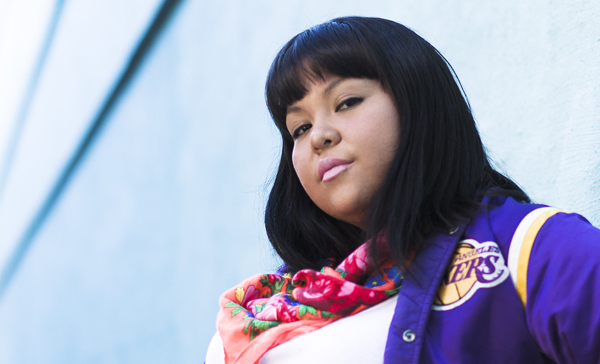 Nuxalk/Six Nations artist Jerilyn Webster, aka JB the First Lady, is “the cutest hip-hop emcee ever”. She’s also a co-founder of the First Ladies Crew – a group of 11 women all doing hip-hop – and the executive director of KAYA – Knowledgeable Aboriginal Youth Association. RPM talked with JB about the labeling of Indigenous music, rapping for elders and the gig that set her on her musical path. RPM: What were the musical influences that brought you to making music? JB: Growing up in a single parent home we didn’t have a TV or anything and we moved a lot. All we had was AM clock radio and so I listened to oldies, like the 50’s and 60’s Motown era stuff. That’s when I first got into music. Then being in an urban setting, Lauren Hill is definitely the person who made me want to create music. Seeing her as a woman and not only rapping but singing and songwriting, and seeing how she was able to express herself in all of those forms, and speak so confidently. In the Native community, I remember exactly when I got y really inspired. It was at the Vancouver Friendship Centre and it was this really cool event called Tribal Wisdom. Tribal Wisdom was invented by young people in the Native Youth movement that was happening at that time here in BC and the performers there were Skeena Reece, Kinnie Starr, Ostwelve and Manik1derful. We had moved almost every year across Canada to different cities, and in these others areas, I didn’t really acknowledge or have any awareness that I was first nations, Indigenous here to Canada. But when I came to Vancouver it was culture shock in the sense that people acknowledged - in a negative way - the colour of my skin and the culture that I came from. When I was at Tribal Wisdom, when I saw the pride, expression, how they felt about their current situation here in BC and about racism - and just being on stage and rocking the show and having so much crowd control I was just like “one day I want to do that and one day I want to inspire young people”. Ever since then I’ve supported all of those artists and they’ve inspired me to make my certain genre of music, to capture the moments and how I’m feeling in my environment. I owe a lot to those people. RPM: You’ve done some shows throughout the province and throughout the country, what has that been like for you? JB: For the last three years I’ve been able to do at least three shows a month all the way from community events to annual general meetings to club shows to youth conferences. I’m in different environments all the time. This one show up in Bella Bella BC at a women’s conference, it was all mostly women elders and, you know, it’s elders – you don’t want to try to make them rock too hard. But it was really interesting though because I got to connect with them. One of my songs called Dear Diary is about this one girl’s story that I worked with here in Vancouver and it’s about suicide. I did that song for them and some of the elders started to cry because they heard my story and they heard my message of this young girl. That was such a good experience for me because these stories of young Aboriginal women and the state of Aboriginal women here in BC and across Canada, are very negative at this moment. For me to be able to speak someone’s story makes me feel good, but also gets it out there, and we don’t get lots of coverage of that kind of thing. Just recently in March I did a show at the Gathering of Voices youth conference in Prince Rupert. There was 1,500 youth and it was so so amazing. The young people just ate it up and they were excited to see myself and Rapsure Risen - a group from the Sto:lo nation - rocking that stage. 1,500 youth with their hands in the air - I felt like I had achieved exactly what I wanted when I first saw those artists at Tribal Wisdom. RPM: What thoughts do you have on the labeling of Indigenous music? JB: As Aboriginal people we’re already so in so many boxes - status, non-status, on reserve, off reserve, Metis, Inuit - so it kind of gets really fuzzy when there’s labeling like that of Aboriginal music as well. But at least we’re acknowledged as Aboriginal people because there’s some Indigenous people - like in Japan, the Ainu people - who no one acknowledges as Indigenous people. So some kinds of labeling is good and some kinds of labeling is bad. It’s a double edge sword in a sense. RPM: What kind of advice do you have for upcoming artists? JB: Invest in yourself. Surround yourself with people who value you. Value your performance fee, value your music. And how you value your music is by registering your songs with SOCAN and putting a bar code your album. Look at your music as projects - you have your writing, your recording session, the production of your cd, the promotion of your cd, and then booking your shows. Those are all mini projects within themselves, and once you can break those down, it won’t seem so overwhelming. Believe in yourself and know that sometimes you’re not going to believe in yourself and that’s just part of the process. RPM: Anything else you’d like to share with the world of Indigenous music culture? JB: Just be yourself and don’t try t be someone that you’re not. There are so many pressures to be a certain way, or a certain look. Who like really taught me about that is Hellnback, from Team Rezoffical. He was like “I’m a chubby Indian guy and I got a Much Music and a Juno nomination” – and he was just being himself and sharing his experience and what he knows. That brought a lot confidence to me - I just want to be as authentic as possible. I just try to practice that every day, in my life and in my music. Catch up with JB at jbthefirstlady.com and on Twitter @Jbthefirstlady.